If you think your average domestic dog gets excited when they see their owner, wait until you see these wolfdogs. They lose their minds! She has said that it is also the reason why she is constantly covered in dirt and has no nice clothes. Sarah says: "The two animals in this video are Spruce and Cochise. Spruce is the dog with the blue eye, and she is a low/no content wolfdog (meaning that she has little to no actual wolf heritage). The gray boy is Cochise and he is a mid content wolfdog." "They were both failed pets and were taken in by the sanctuary when their respective owners were unable to provide homes that met their needs." "Cochise and Spruce are incredibly friendly but also incredibly high energy, and being able to run around their acre large enclosure and howl with their neighbors has led them to be happier and more well adjusted than they ever were as house pets." "Wolfdogs are perhaps the most misunderstood and mismanaged animals in America" She said. 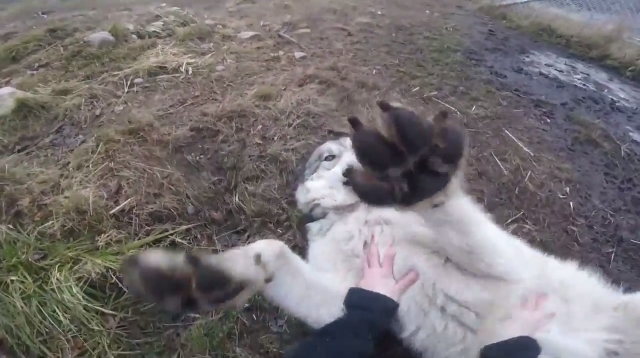 Responses to "Wolfdogs Welcome Home Owner With Howls And Kisses"
Oh yeah gotta have those belly rubs!